I emptied Kuching Mentel yet again today... This will be earnings for October! A grand total of $132.50. Rounding off that and rolling my $2.50 back into KM, so that's, yet again, $130 for October!!! Making it a GRAND GRAND total of $130 + $130 + $96 = $356 cold hard cash in just 3 months! The Fairytale-inspired Cones on the Roof of a Church, originally uploaded by tgtwb. The interior is absolutely stunning. You can't miss this. 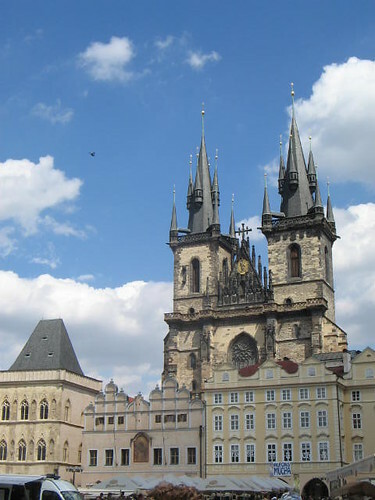 It towers over the Old Town of Prague and can be seen from the Astronomical Clock of Town Hall (where the nice sidewalk cafes are). Pawwing Little India In One's Own Land! We were pawwing the streets of Little India during the Diwali weekend early this month and like every festive month, we would be joining the huge crowds, rubbing shoulder to shoulder with just one simple intent - TO SHOP! Festive seasons in Singapore are often celebrated with the hanging of huge decorations and street lightings, so you cannot help but feel a part of the community. I guess that's one of the reason why Singaporeans are often respectful of each other despite our ethnicity, which is really, a very commendable thing. Along the streets of Race Course Road, also known as Little India or Tekka by the locals (named after a wet market in the area), we see grand street light-ups to welcome in the festive. According to a Hindu friend of mine, Diwali basically means "row of lights" or the festival of lights. It signifies the welcomed return of Lord Sri Rama 14-years "retreat" into the forest to become king. So to celebrate his return, Hindus express their happiness by lighting up lamps, (as an offering to God for health, wealth, knowledge etc. ), decorate their houses, indulge in festive sweets and go visiting to the homes of friends and families to renew their kinship. And like most other celebrations in Singapore, we have night bazaar (or night market) in the particular area densely populated by the race in celebration. This year (and every other year i should think), the night bazaar is held at Birch Road, just opposite of the widely famous, popular and packed, Mustaffa Centre. Information on Mustaffa Centre can even be found on Wikipedia - thats how HUGELY popular this place is. Visitors probably knows Mustaffa Centre better than the Singapore Merlion! Haha! At the corner of the bazaar is the "kerepek" stall, which basically sells the dried goodies and chips the Indians call, "Murukku" (in Tamil) - which is a savoury snack made by grounding spices (like cumin), lentils, rice and butter then fried in coconut oil. Very addictive and tasty... But those looking to cut them calories should stay away from it completely. One is never enough!!! I like the idea of them hanging the savoury snacks... Definitely attracts attention! Apart from the food, the bazaar also offers beautiful, colourful, sequine-heavy punjabi suits and kurtas (for men). The Indians (Hindus) are encouraged to put on clean and new clothes especially during visiting. Like we needed to be told to do that!!! Because we were there during the last weekend and just 2 days away from Diwali, goods sold at the bazaar (whose prices were initially quite steep) were probably slashed into half at least to tempt patrons into purchasing. The idea is to let go of the products this year, because next year, no one wants to buy "last year's" fashion! "Henna Tattoo" are a craze here in SG. And for Hari Raya as well as Diwali, people are actually willing to queue to get their hands and feet "tatooed" with henna ink by the Henna Tattooist. Depending on the intricacies of the design, it can probably range between S$5 to S$150! Or even more, i dunno... I've never done them before and i don't think i will. Cubbies don 't want her cute fat paws in colours other than furry brown!!! Bah! With just a tube of henna, the tattooist skillfully "squeeze" her way through those, by now, i think, tired little hands, keeping in mind the design of choice. See what i mean by multi-ethnic? That even though this is a celebration meant for Hindus, everyone is welcomed to join in! Shisha (or hookah... gasp!) pipes are also found at the bazaar. Although the Indians have something to do with the origins of the pipe (it actually originated from India), it is hugely popular in the Arab world that people often mistook it for an "Arab thing". Know why i said Mr. Mustaffa Centre is one of the most insanely popular spot for shopping in Singapore?